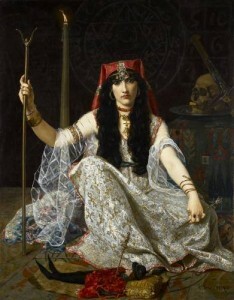 Hexes, curses, the Evil Eye! Jinxes, tricks, and plain old mean people! The world is filled with dangers that the educated spell-caster knows how to sidestep and overcome. Join Judika Illes, author of The Big Book of Practical Spells, Encyclopedia of 5000 Spells, Encyclopedia of Witchcraft and other books of magic, at Magickal Realms in the Bronx on Sunday afternoon, August 21st at 2:00 pm for a class devoted to Defense Against the Dark Arts. ● Are you really cursed? How can you tell? And if you are, what can you do? ● We’ll discuss techniques of removing and healing existing crossed conditions. Ticket price: $45.00. Please contact Magickal Realms directly to make reservations. Looking forward to seeing some of you there! Notes: Hexes, curses, the Evil Eye! Jinxes, tricks, and plain old mean people! The world is filled with dangers that the educated spell-caster knows how to sidestep and overcome. Join Judika Illes, author of The Big Book of Practical Spells, Encyclopedia of 5000 Spells, Encyclopedia of Witchcraft and other books of magic, at Magickal Realms in the Bronx on Sunday afternoon, August 21st at 2:00 pm for a class devoted to Defense Against the Dark Arts.